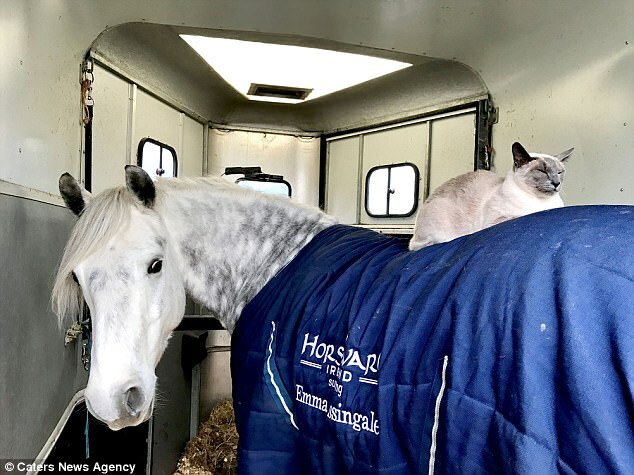 Louis is my purr-fect stablemate! 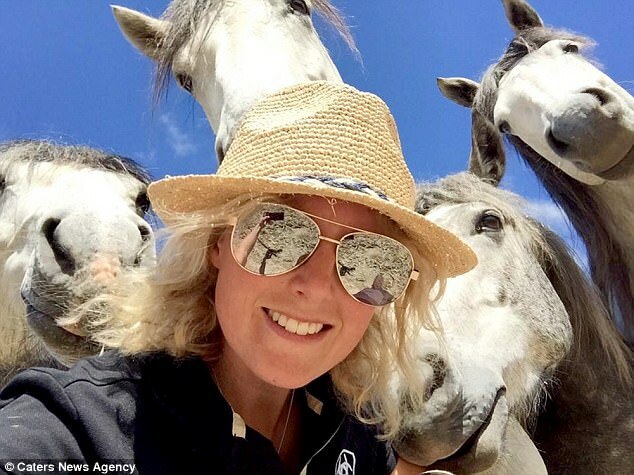 Horse trainer Emma Massingale said they nuzzle up together after rides. 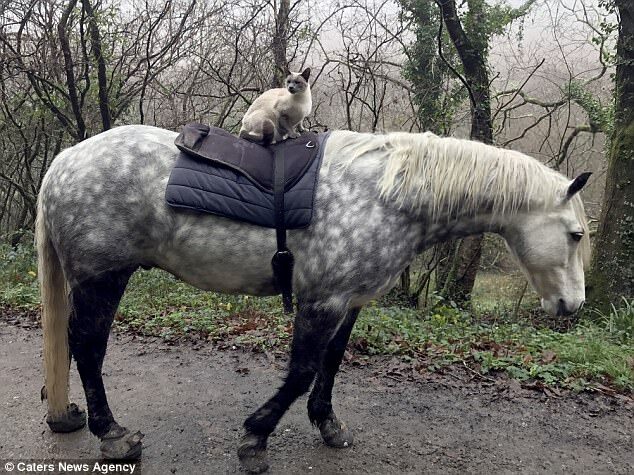 This Siamese cat decided to relax and put its paws up by going for a scenic ride on top of a horse. 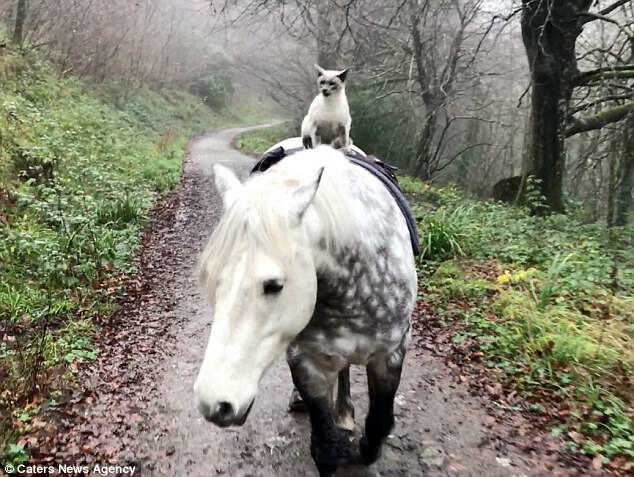 The unlikely pair go for rides near their home in Holsworthy, North Devon. 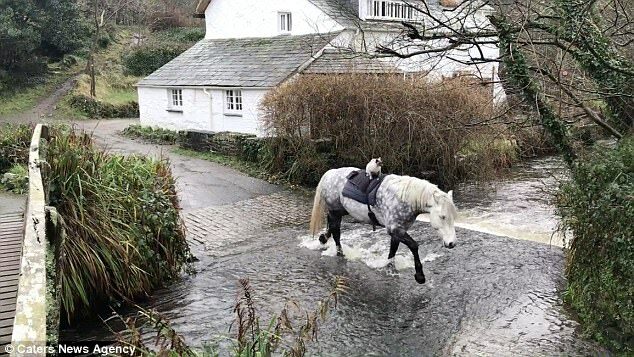 Equestrian Escapes have some fantastic riding holidays in North Devon. Explore North Devon's stunning landscape and ride along the beautiful coastal paths and clear beaches that have led to this location being classified as an area of outstanding natural beauty. In addition to horse riding, Devon also offers a great range of opportunities for relaxation, sport and family fun. Enjoy gentle or challenging walks, great beaches, museums, galleries, surfing and you might even bump into Louis and Comet along the way! The pair take a leisurely stroll through woodland, crossing a bridge and splashing through a stream before making their way back home. Ms Massingale said: 'It all started when I was riding Comet and I would just tap my leg and Louis would jump on. 'Now all I have to do is tap Comet's back and Louis is straight there. He doesn't need anymore encouragement than that. Although Louis is an intrepid explorer, he won't be caught riding out in the rain. Ms Massingale added: 'People often do a double take when they see him out but lots don't notice him until he meows.